Keels & Wheels Concours d’Elegance Announces 2013 Grand Marshal: Indy 500 Champion Al Unser, Jr. The 18th Annual Keels & Wheels Concours d’Elegance, benefiting The Boys & Girls Harbor, announced that two-time Indy winner Al Unser, Jr. will serve as the 2013 Grand Marshal. Unser will be on the grounds throughout the weekend of May 4-5, 2013 at the Lakewood Yacht Club in Seabrook, TX meeting participants and visitors, signing autographs, and participating in the awards programs. Unser has accumulated a tremendous record of success as a race car driver throughout the last 30 years. Continuing his family legacy, Unser Jr. won the Indy 500 championship in 1992 and again in 1994, making him the first second-generation Indy 500 champion. In addition to Unser’s two Indy 500 wins, he is a two-time CART champion (1990, 1994), two-time Rolex 24 Hours of Daytona winner (1986, 1987), and two-time IROC champion (1986, 1988). Unser has also competed in NASCAR events, including the Daytona 500, and was inducted into the Motorsports Hall of Fame of America in 2009. 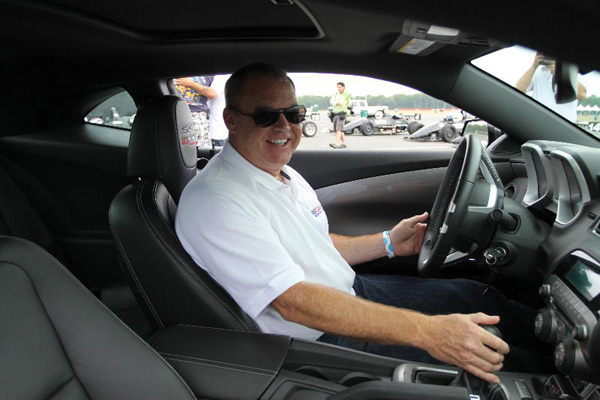 Unser continues to embody the racing spirit through his driving clinic program called “The Al Unser Jr. Racing Experience”, the Race Clinic for Paralysis charity and speaking engagements. Keels & Wheels Concours d’ Elegance is a classic car and vintage wooden boat show that takes place over the course of one weekend each spring at the Lakewood Yacht Club in picturesque Seabrook, Texas and attracts more than 15,000 attendees. The exhibitors and spectators come from every part of the United States, contributing to the more than $1 million that the Concours has raised to date for local charities. To schedule a media interview with Al Unser, Jr., please contact Kim Padgett at The Padgett Group at 713-590-3770 or via email at Kim@ThePadgettGroup.com. For more information about the 18th annual Keels & Wheels Concours d’Elegance, please contact Bob Fuller at (713) 521-0105 or visit www.keels-wheels.com and our Facebook. Keels & Wheels Concours d’Elegance is a weekend-long, nationally acclaimed classic car and vintage wooden boat show that takes place each spring at the Lakewood Yacht Club, at 2425 NASA Parkway, in beautiful Seabrook, Texas. Founded by Lakewood Board Members Bob Fuller and Paul Merryman in 1995, today Keels & Wheels welcomes approximately 200 cars and 100 boats, and has raised more than $1 million for local charities, while drawing thousands of participants and spectators from all over the U.S. and Europe. Judging for the Concours event is held Saturday for both boats and automobiles. Nearly 60 car judges and 20 boats judges evaluate approximately 40 classes for cars and 20 classes for boats. The boating side of the event is sanctioned by the Antique and Classic Boat Society, an International organization established to standardize the judging procedure. The awards ceremony takes place on Saturday for the boats and Sunday for the cars, with main categories including Best of Class and Runner Up, as well as Best of Show for both cars and boats. Further awards include Corinthian Awards for noteworthy entries, Emeritus Awards for individuals who have contributed significantly to the event, and People’s Choice Awards. Proceeds from the 2013 event will again benefit the Boys and Girls Harbor, whose mission is to provide a home and safe environment for abandoned and abused children and healthy, comprehensive care for children and families in crisis. For more information please visit www.keels-wheels.com or follow us on Facebook and Twitter.